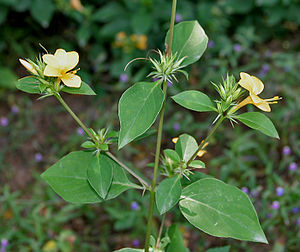 Barleria prionitis or Vajradanti has been used in India for a long time for many medicinal purposes. Its chief use is in treating oral disorders like gingivitis, dental caries and is commonly used in Ayurvedic mouthwashes, creams and pastes. Please note that the above slideshow is automatically created by searching Flickr and does not contain manually curated images. 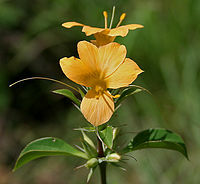 Hence, it is likely that some images may not be exactly of Barleria prionitis. Acanthaceae The family Acanthaceae (or Acanthus family) is one of the most successful Angiosperm dicot taxon. 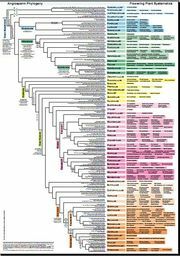 It contains almost 250 genera and 2500-4000 species. These species are mostly distributed in the tropics as herbs, shrubs, or twining vines; some are epiphytes. The representatives of the family can be found in nearly every habitat, including dense or open forests, in scrublands, on wet fields and valleys, at the sea coast and in marine areas, and in swamps and as an element of mangrove woods. Plants in this family have simple, opposite, decussate leaves with entire (or sometimes toothed, lobed, or spiny) margins, and without stipules. The leaves may contain cystoliths, calcium carbonate concretions, seen as streaks on the surface. The flowers are perfect, zygomorphic to nearly actinomorphic, and arranged in an inflorescence that is either a spike, raceme, or cyme. Typically there is a colorful bract subtending each flower; in some species the bract is large and showy. The calyx is usually 4-5 lobed; the corolla tubular, 2-lipped or 5-lobed; stamens either 2 or 4 arranged in pairs and inserted on the corolla; and the ovary superior, 2-carpellate, with axile placentation. The fruit is a two-celled capsule, dehiscing somewhat explosively. In most species, the seeds are attached to a small, hooked stalk (a modified funiculus called a jaculator) that ejects them from the capsule. The plant is used in several parts of the world as an ornamental plant. In India, it is found in many dental products and skin creams. Seeds germinate in 13-77 days, grow slowly at first, but then at the rate of around 0.5 m/year. The species is generally considered as a weed in most of its range as it is spiny and not eaten by cattle. This page was last modified on 6 September 2010, at 07:58.